Urnsi Serethi is a Dunmer huntress living in Aleswell. Her brother, Diram Serethi, runs the Aleswell Inn. Like the rest of the town's population, she fell victim to Ancotar's inconsiderate experiments down in Fort Caractacus, and it's up to you to resolve the problem. 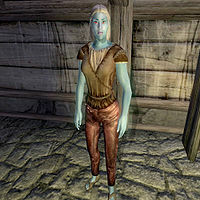 She is fairly inactive, spending all day and night wandering around the Inn with her brother and sister Adosi Serethi. Her extremely low disposition towards everybody but Adosi allows her to be heard insulting the regulars at the Inn during the busy hours between 6pm and 9pm. She wears a set of common lower class clothing, a belted vest, a pair of huntsman moccasins and laced leather pants, and she carries a small amount of gold. Like the other residents of Aleswell, Urnsi has a constant Chameleon ability that causes her supposed invisibility. It is quite difficult to get a word out of her, even if you're trying to help with the town's invisibility. All she will give you is a quick and patronizing pointer towards her brother, "Oh, really? I’m invisible, you say? Thanks for letting me know. Talk to my brother Diram if you want to know all about it." Regarding Ancotar, she will show exactly how unimpressed she is by him, "If he's smart, he'll keep out of my way. High elf and a mage to boot, the worst kind of arrogance." If you should happen to fail the quest, there's no doubt that she really isn't very fond of her brother - or anybody else for that matter: "It’s almost worth staying invisible forever, just to see how much it annoys Diram. But that doesn’t make me like you any better." If you succeed the quest, she will analyze you from her own unique perspective, "You really enjoy this whole hero thing, don’t you? Everybody fawning all over you? I’m not like that." Diram, who isn't particularly impressed with his sisters' attitude towards everybody else, will make a bittersweet joke after the quest is finished, "My sisters, on the other hand... I wouldn’t mind if they had stayed invisible! Ha ha ha!"